The Osaka management innovation plan certification | News | OSAKA WINTON Co.,Ltd. Thank you for coming over to the homepage of Winton Osaka Co., Ltd. 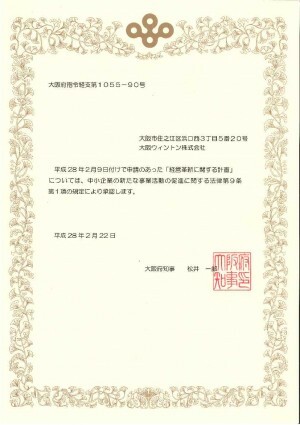 This time Osaka Winton Co., Ltd. was accepted as an Osaka management innovation plan approval company. This time I renewed an official English site homepage of Winton Osaka Co., Ltd.
Osaka Winton Osaka Co., Ltd., please from now on. If there are inquiries indication an opinion, to the follows, please. In the case of an inquiry, I would like it from this inquiry form in WEB. In the case of an inquiry, I would like the telephone to Telephone +81-6-6676-2812. 2018/10/15Please take care of the dark site! 2018/04/20Bird strike measures finally start! 2016/06/14Bird strike measures finally start! Copyright © 2019 OSAKA WINTON Co.,Ltd. All rights Reserved.